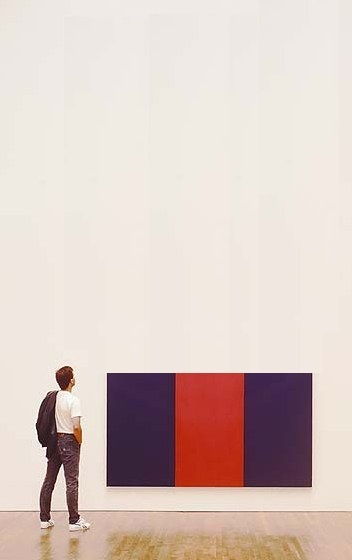 With Barnett Newman in the air recently, I began looking back through the greg.org archives, and I found this 2009 post about the art and space objects at Expo 67, which is a great read, if only for the smackdown delivered by NY Times critic John Canaday. 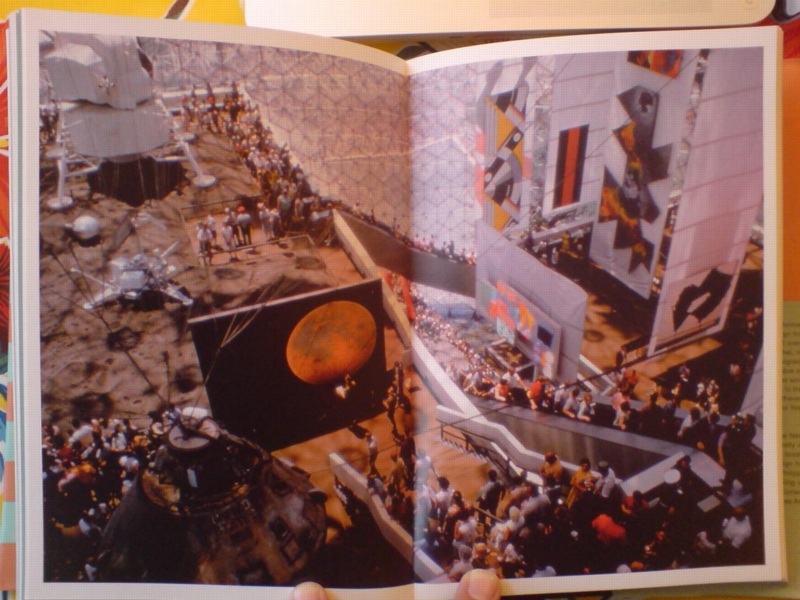 I was already into satelloons and photomurals and World’s Fairs as odd, underconsidered contexts for art when it registered that Alan Solomon had curated a whole painting show for the US Pavilion in Montreal. He basically asked all the artists for work that could be hung vertically, would hold up visually in a giant geodesic terrarium, and would pretty much only be seen from an escalator. And that’s what he got. Barnett Newman’s Voice of Fire is there in the upper right corner, looking really small between the Lichtenstein and Johns’ Dymaxion Map. 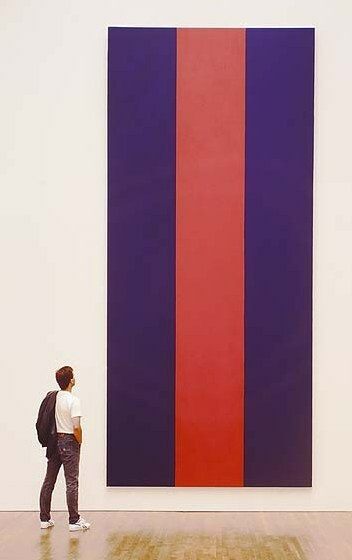 Which just goes to show you, because here it is in the National Gallery of Canada, which bought it in 1989. A work of confounding scale. And not without its charms. It’s not my favorite Newman, but I like Voice of Fire. It looked great in Ann Temkin’s Philadelphia retrospective. And last night, I wondered what it’d be like to live with. Because at 8′ x 18′ it is pretty unwieldy. In principle it’d be nice to have 20’+ high space at home to hang it freely. But that kind of room is really a gallery, even if your breakfast nook is just through the door. 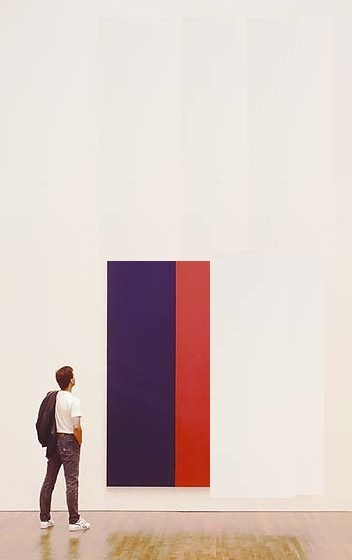 So barring that, you could turn it sideways, which is how Newman painted it. If 12×25 is too long a run of uninterrupted wall for you, though, you’re stuck. And so I wondered about cutting it down. We sure don’t cut up paintings into saleable parts like they used to. Like they did with altarpieces [hello, Piero at the Frick] where everyone on his Grand Tour got to take home a panel or predella. 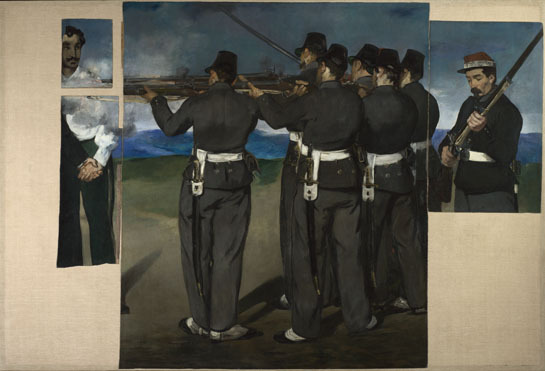 Even barely a hundred years ago, Manet’s heirs were chopping up the uncomfortably political Execution of Maximilian into more marketable groupings. And look, now most of it’s in the National Gallery [of England]. 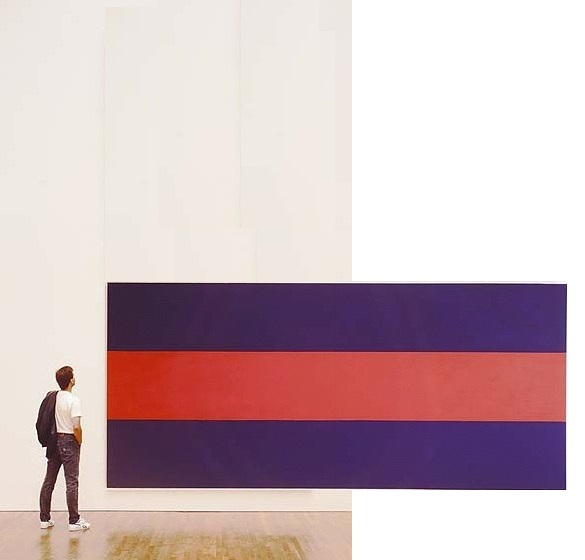 I’m not saying there’s no contemporary precedent: Gerhard Richter cut a squeegee painting into 64 little ones. And this BMW Rauschenberg campaign reminds us that Aaron Young painted dozens of panels at once at the Armory that one time, with the motorcycles. I’m just saying maybe it’s not enough. We could do more. I understand Voice of Fire is very well known in Canada, and that the National Gallery’s purchase of it was controversial. So should Canadians ever face an arts crisis where, say a Taliban- or ayatollah-style regime takes over that is decidedly unsupportive of the kind of painting Newman practiced, I’d think cutting it down and dispersing the painting would be far better than burning it. Or bombing it, Buddhas-of-Bamiyan-style, out of existence. Or maybe it’s just the populist thing to do. Voice of Fire would suddenly be much easier to display in a modest home. Or several, actually. To start, you could cut it two ways: in quarters [above] or in slices [below] slices. Each approach yields four attractive, wall-filling pieces, each 4×8.5′, that preserve the original proportion while making a rich, full allusion to Newman’s overall composition. Reassembling such a group for an exhibition 500 years from now would be trivial. You could also cut it into 8 pieces, roughly 4×4, almost easel-size. Voice of the Fireplace. But then it seems like you’d be losing a lot to the stretchers. So, what, you’d mount the pieces? Frame them? I imagine you’d get a mix of decor decisions from the various owners. Which, yes, no, I haven’t thought through the pricing and sales strategy yet. This is really just starting out.